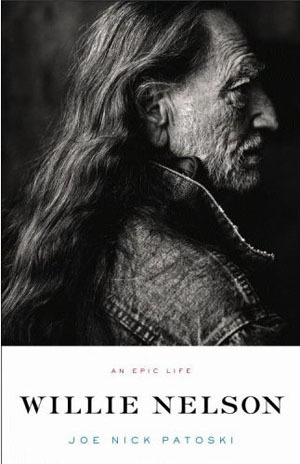 “Epic” is the key word in the title of Joe Nick Patoski’s 567-page biography on Willie Nelson. Drawn from dozens of interviews and scores of oral histories, books and articles, Patoski paints a comprehensive picture of his fellow Texan. If Patoski skimps on Nelson’s childhood – less than 50 pages are devoted to his years as a minor – he makes up for it by piling chapter on top of chapter about Nelson’s early family life, struggles as a disc jockey and songwriter for hire and, finally, as a nascent country performer. Patoski also devotes an entire chapter on IRS struggles and puts in strong perspective how such horrible accounting could have transpired. But while Patoski’s journalism skills and research is impeccable, he spends too much of his time telling and not enough showing. For example, there piles of anecdotes about Nelson’s generosity and his inability to say no. He sticks around for hours after concerts to sign autographs, and lavishly gifts his friends and family. When a credit card company asked him to put his face on their card, he said yes without thinking of the consequences. Manager Mark Rothbaum has to explain the implications. Nelson asked Rothbaum to get him out of the deal, but the reader is never given understanding of what compels Nelson to be so affable. The person who shines best is Nelson’s longtime drummer Paul English. English doesn’t appear until a third of the way through, where he initially surfaces as a pimp who drills and robs pinball machines and operates backroom card games. When Nelson’s drummer failed to show up for a radio session, English is recruited. Even though he had never played drums before, but the experience went well enough English accepted Nelson’s invitation to walk away from the lucrative prostitution business and join the band on the road. English’s skills with a gun and knife were handing in prying a reticent promoter away from the band’s money and bailing Nelson’s smart mouth out of fight. English was never shy about displaying the pistol he always carried, which was usually all it took to calm any disagreements. English’s black market background also came in handy procuring marijuana for the band. Patoski’s meticulous exploration sheds light on Nelson’s long walk to fame, where record labels and producers try in vain to pigeonhole the artist, and Nelson’s inability to fit into their boxes, even when he gamely goes along. Later, as Nelson’s fame and wealth grows, he builds a studio on his Texas estate. Patoski conveys a laid-back atmosphere where music flows as freely as beer and songs are recorded as effortlessly as lighting a roach. That Nelson practically lived in his studio explains the prolificacy of his catalog (he released two albums in 2008), and the easygoing environment explains how his financial problems reached the boiling point. That Nelson’s music has attracted rednecks and hipsters alike is less mystifying after this thorough examination of the man. The songs are merely an extension of the personality: Nelson is willing to meet anyone anywhere for a good time. The access Nelson provided for this thick tome can rest proudly alongside his albums as a testament to the man’s generosity.